When you want to surprise your guests, be original and enhance the experience, you must think creatively. 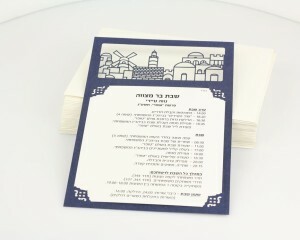 There are many ways to do it, and they all start with a special Bar-Mitzvah invitation – an invitation that heralds a perfect, meticulously planned and exciting event. Whether the event is to take place in Jerusalem with its main theme a Bar-Mitzvah celebration at the Wailing Wall or whether it is planned as an outdoors Bar-Mitzvah event – all of these elements mean that a happy event may be expected. 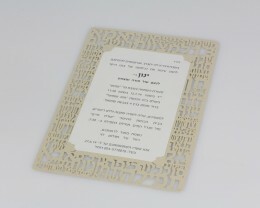 The best way to get the invitees in the appropriate mood and light up their anticipation is sending a specially designed laser-cut invitation that would evoke sentiments as soon as the envelope is opened. A special prestigious invitation is an invitation the guests keep as a memento long after the event ends. 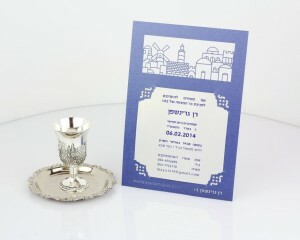 Our invitations are designed to be kept as mementos, as the invitation converts into an elegant picture frame. Simply follow the folding instructions, extend the dedicated “kickstand” supporting the frame, insert a photograph taken at the event and you have an amazing frame made from lace paper.